Apple has begun sending out invites to an iPhone event to be held on Tuesday, October 4, 2011. 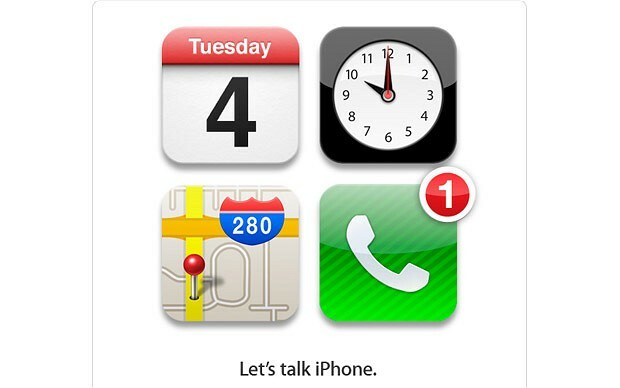 The invite, which says “Let’s talk iPhone”, uses Apple’s iOS icons to indicate the date, time and location of the event. Though the invite does not specify, the event is widely expected to be the launch of the iPhone 5, Apple’s latest model in its successful mobile handset range. However, there has been some speculation that the new model could be a minor improvement on the iPhone 4, perhaps called the iPhone 4S. It is thought that the new iPhone will have a faster processor, probably the same A5 processor that powers the iPad 2, and a better camera. There have also been rumours that the new phone will have more RAM than its predecessor and will have a slimmer form factor. Whatever form the new device takes, it is likely to launch alongside iOS 5, the latest version of the operating system that runs the iPhone, iPad and iPod touch devices. Announced in June, iOS 5 brings an improved notification system, a task management system called Reminders and iMessage – a free, text message service for Apple users. The early October announcement suggests that the new iPhone will be in the shops within a couple of weeks. The October 21 release date, suggested earlier this month by the tech blog This Is My Next, looks like a good bet.